ANSTO’s brand new educational science show is set to bust common myths about the Internet as the World Wide Web collides with cutting edge science. Touring Australia in 2016 and 2017, community members in the Sutherland Shire will be among the first to preview Fact or Fiction 2.0 – Web of Intrigue on Thursday 29 October. Can I have the Internet in my eye? Does Facebook know me better than my mother? How much does the World Wide Web weigh? Can you separate the Fact from the Fiction on the internet? 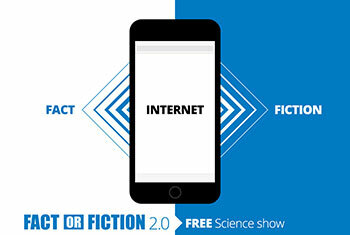 Fact or Fiction 2.0 is a 90-minute show where the audience watch popular internet clips before voting on whether the information featured is actual science fact or pure science fiction. Once the audience voting has been locked in, a panel of ANSTO scientists will critique the science featured and provide the answer. The show has been designed to be highly entertaining and educational. It’s primary objective is to attract those that aren’t necessarily interested in science by providing them with a big dose of pop-culture. Fact or Fiction is suitable for those aged 8 and above. Rod Dowler is the Discovery Centre Leader at ANSTO.